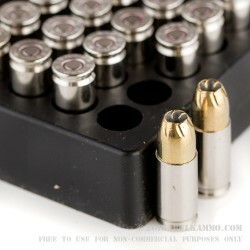 A fantastic defensive option for the 9mm duty or concealed carry shooter. This is a heavyweight projectile that has a long history of providing excellent stopping power in varied situations where threat stoppage is of premium importance. This is a 147 grain jacketed hollow point in the Remington Golden Saber Line and features a proven track record of performance. 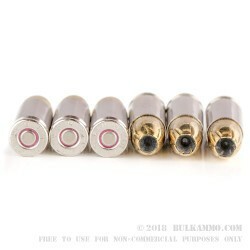 The cartridge also features a nickel-plated brass casing that offers a high-end result from a feeding and extraction perspective. The casing is also reloadable thanks to its ability to shed powder and debris and because of its Boxer primer. The brass is of exceptional quality. It can be reloaded successfully many times with the proper care and attention. 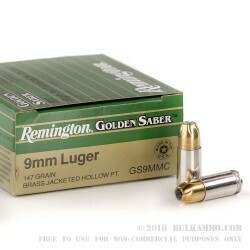 As a legacy hollow point, this is part of the First Generation of the Golden Saber line by Remington but has all the best improvements that the line underwent as it sat on top of the field relative to peers. It is not the newest iteration of the line, but it has all of the prowess and performance of the original product, and that performance is legendary. The 147 grain bullet is a premium choice for those who can sacrifice a little speed to improve inertia on target and want the larger bullet mass.